Big Momma, from western PA, caught over 20 fish. 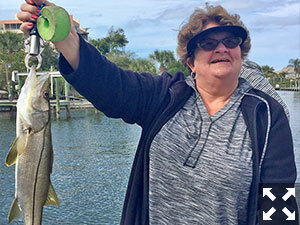 Big Momma, who hails from somewhere outside of Pittsburgh, PA, forced her husband and best friends to go fishing on one of the coldest days of the year. With water temperatures hovering around 52 degrees we headed out in search of some fish. As luck would have it she smoked the boys with over 20 fish caught and topped it off with a snook at the end. What a great gal and a great fisherman as well. Can’t wait to see them again next year! I've been a fishing guide the Sarasota , Boca Grande area for over 25 years. My Sarasota trips are mostly family oriented 1/2 day fishing trips involving kids who love to catch all the family fun fish. My Boca Grande trips are for the more experienced spin or fly fishing angler.